Making a cleaner, greener Bali. The island of Bali sure is one of nature’s miracles. An island paradise where the turquoise waters are as warm as the summer air all year around, limestone cliffs tower over dreamy beaches and inland, dramatic jungle-scape meets rice terraces in hues of green you won't find anywhere else in the world. Of course the luxury hotels, world-class dining, endless opportunities for shopping and the famous nightlife are draw cards, but all of this has manifested for the love of Bali’s natural beauty. Tourism has been a part of Bali for at least 70 years, with it especially booming in the last 20 and it’s rapid growth is looking to continue. The environmental impact this has left on Bali has been equally explosive. The population of Bali is over 4 million and with over 4 million visitors per year the population is growing faster than the infrastructure can handle. Indonesia is also the world’s second largest producer of plastic, however, is only the fourth populous country in the world. It’s no secret to anyone who has visited Bali the environmental issues Bali faces. Those of you in Bali now might have noticed that along with the arrival of the onshore winds and big rains, there is also the return of plastic out of rivers and onto the beaches. This is one of Bali’s many environmental problems, yet we are still a long way off restoring Bali. What is needed is action on a large scale - and now. Luckily, there are a number of non-profit organisations and forward-thinking businesses that are working to bring balance back to the island.... We thought we'd share some of these amazing businesses with you. Perhaps with plastic only being introduced to the island 30 or so years ago, many locals are yet to contemplate the afterlife of plastic waste. Bye Bye Plastic Bags is a truly inspiring youth driven initiative founded 4 years ago by two sisters, Melati (16) and Isabel (14) Wijsen. The girls did some research and found studies that prove that by 2050 there will be more plastic than fish in the sea including harmful micro-plastics from things like cosmetics, sun care, clothing and industrial processes. They also found out that the production of plastic bags requires petroleum and often natural gas and chemicals. Its production is toxic to the air, and the burning (which we see on a daily basis here in Bali) is much worse and cancer causing. Studies show that the amount of petroleum used to make a plastic bag would drive a car about 115 meters. It would take only 14 plastic bags to drive one mile. The girls decided to focus on a realistic target- plastic bags. In one of the organisation’s biggest victories to date the girls were invited to present as a TED talk in London in September 2015. They have already empowered youth in Australia, Jakarta, Guadalajara, New York, Nepal, Myanmar, China, Singapore, and the Philippines to spread the anti-plastic bag message locally. 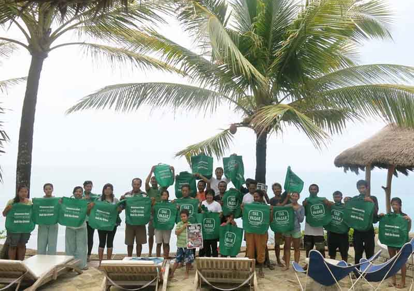 Their other huge victory, they successfully lobbied the government in Bali through petitions and campaigning to become plastic bag free in 2018. Many outlets in Bali now offer alternative bags, or charge for plastic bags. They have even gone from neighborhood to neighborhood distributing re-useable bags. Their next goal is to work their way into Bali’s education system and eventually go Indonesia wide. Perhaps the best things about Bye Bye plastic bags? We think it empowers EVERYONE to take action- Melati and Isabel were just 12 and 10 when they founded the movement and now they lead a team of youth of 25-30 kids from all over the island, local and international. The NGO is now one of the most recognised and powerful in Bali. According to the girls, what can you do today? Say no to plastic bags. Volunteer. Raise Awareness. A small donation can go towards printing educational booklets or producing alternate bags. Bali has no recycling system, largely due to a lack of government funding. Rob Withrow and his partner Oliver Mauger decided to tackle the island’s waste problem with their not-for-profit organisation, Bali Compost Crafters. 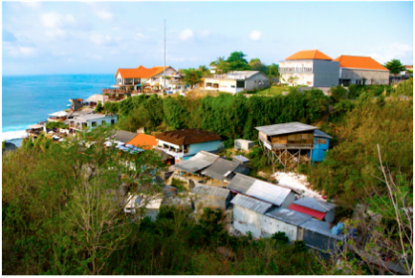 They operate out of Bali’s major trash site, the Suwung dump located near Bali’s most popular tourist areas. More than 3000 cubic meters of waste are trucked to the site each day, containing 60% recyclable green waste, and 5 to 10% mixed plastics that are recoverable. This doesn’t account for what is thrown in rivers and vacant blocks of land all over the island. Rob believes the first step is exposing the value of what is being lost- Bali is literally sinking in waste. 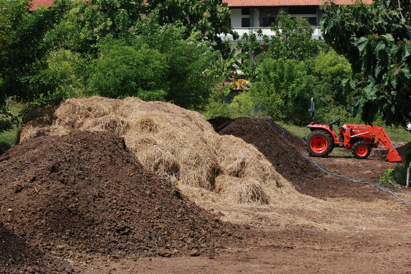 On a plot donated by Udayana University at the entrance of the Suwung dumpsite, Bali Compost Crafters is currently converting 3% of Green waste into nutrient packed super compost to replace chemical fertilizers to promote sustainable farming. Corruption is often blamed for the lack of financial resources going towards the problem, however in less developed countries better roads, lighting and electricity for remote villages and upgrading infrastructure takes priority. The only way to catch up to the ‘waste monster’ will be large scale investment from private sectors to build a new dump site, architecturally designed to receive waste that has been separated. “The key that unlocks this knot is separation. This is taught to school kids, who take it home and when they grow up, and teach it to their kids- then threat is over” Rob says. “There's no value in judging who is to blame, or why this should be someone else's problem. It's just a thing that has come up in our lifetime, as a result of conditions that occur and exist around the time that our lives are taking place. Bali Compost Crafters and these other efforts need every gram of support we can muster, because the problem is already greater than anyone feels comfortable knowing or telling others about”. 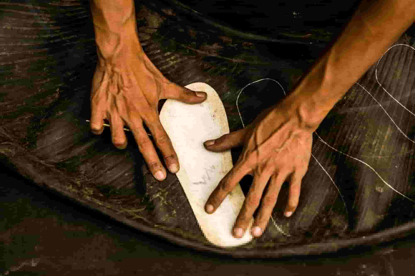 Kyle Parsons was on a surf trip in Bali when he discovered a pair of sandals that used motorbike tires as the sole. Surrounded by a flurry of motorbikes he began to ask some questions. Used tires account for a huge portion of waste in the world, with 1.5 billion of them being dumped every year. Tires take thousands of years to decompress- this means the first ever made is still out there somewhere! Many third world countries such as Indonesia burn tires as a cheap substitute for fuel which leads to toxic fumes being released into the atmosphere as well as harmful oils into the ground and water table. Few people also realise that used tires are breeding grounds for mosquitos and subsequently 30% of mosquito born diseases such as dengue, malaria and the recently topical zika virus. In 2009 Kyle met Kai Paul who believed in the concept and together they created Indosole- a footwear line with a revolutionary production process and appealing design aesthetic which promotes awareness through selling conscious footwear with a trendy aesthetic. They guy’s philosophy is this- “It is a big team effort to keep Bali beautiful and also keep in mind that it can be a test model for many tropical islands around the world, we are all in this together, breathe the same air, and swim in the same oceans. We are in this together as humans living on Earth, not just connected via Bali, it is a worldwide movement.” Indosole footwear is available at a number of retailers across Bali, and also at indosole.com. Kelly Slater famoulsy tweeted in 2012, “If Bali doesn’t #DoSomething serious about this pollution it’ll be impossible to surf here in a few years”. 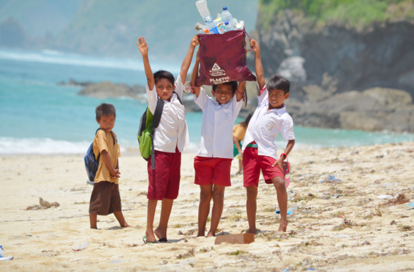 Project Clean Uluwatu is an organisation founded by the cliffs of Uluwatu, an iconic surf destination for surfers from all around the world. What was once a surfer’s paradise became polluted with waste from hotels and warungs located along the cliffs as the area grew in popularity. The Project Clean Uluwatu team saw the need to develop an environmentally friendly waste processing system specifically for organic liquid waste in an initiative supported by local and international surfers. 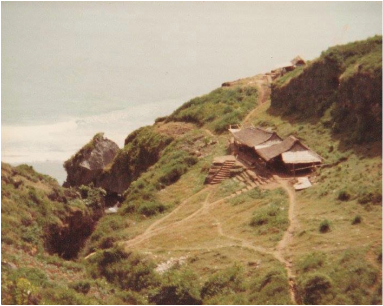 With more than 50 warungs and shops located on the cliffs and no functional liquid waste system in place, many surfers noticed the unpleasant smell. With help from engineers, PCU has developed a design for a system that will manage all liquid waste from Uluwatu. The project started in May 2013 and the cost is $50,000USD(for a simple diagram, see below). Since then, PCU has facilitated the processing of over 1,800,000L of waste that otherwise would have ended up in the ocean. Also along with ecoBali, every warung was given a bin for each organic, and non-organic waste. Bins with lids were installed on the stairs and now all rubbish from Uluwatu is collected 3 times weekly by ecoBali and disposed of responsibly. Their next step is to build a composting system at Uluwatu. 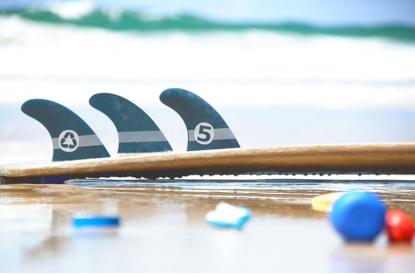 Each set of fins is made from approximately 100 bottle caps that have been collected from Bali’s beaches. They are then sent to recycling facilities in Java where they produce recycled pellets. The material refinement takes place in Australia and they are then moulded into the final product. The result is a product competitive in performance with other fins on the market, with ideal stiffness for small to medium waves and compatible with a variety of boards. Through sales of t-shirts David and his team fund thousands of posters for warungs (local style eateries), and through donations produced over 30,000 re-useable shopping bags and distributed them all through Bali. Their message is this- “Bali needs to reduce the plastic trash, separate the recyclables and compost the food scraps”. David’s 11 year old son Oscar is also doing his bit- he has spoken in front of adults and also at government schools around Bali. Together they present to students in the hope that one day one of the students becomes the Governor of Bali. All donations go directly towards funding television commercials which reach thousands of people in Indonesia per day. Keep Bali Clean hope to grow their social media following also so they can increase awareness and shame people that are still littering. None of these organisations and businesses are pointing fingers- as a developing country, the prioritisation of funds are majorly directed elsewhere and education is only just becoming implemented. Just 20 years ago, even fully developed countries such as Australia faced waste and littering problems. The government was able to spend millions of dollars on campaigns and recycling programs to fix this. Cleaner waterways have been restored, sea life is thriving and landscapes are beautiful again. If you’ve travelled to Bali once, twice or 10 times, if you are a local resident, if you have adopted Bali as home, if you are a beach goer, a surfer, nature lover, let’s remind ourselves that individual shifts in consciousness, creates a collective movement. If you want to make a difference you can. Donate, volunteer, be conscious of the waste your produce and spread the word via social media or anyway you can. Let’s work together to keep our island beautiful. Written by Rosie, one of our amazing Account Managers that is too, hoping for beauty to be restored to all of Bali’s beaches, all year long.